The next time you do yard work, you might want to consider something that takes less time and money to maintain than a lawn. Wouldn't it be nice not to have to mow every week to keep the neighbors happy? Those water bills in the summer can get outrageous. What if you could make your garden maintain itself? You could just come home, pick a few vegetables for dinner on your way in, and have curb appeal that would be the envy of the neighborhood! In 1959, a scientist in Australia was studying animals browsing for food in a forest and wrote in his journal "I believe that we could build systems that would function [for humans] as well as this one does." Bill Mollison went on to coin the therm permaculture by combining the words permanent and agriculture. We suburbanites love our lawns. But now that life has gotten more busy, we have started to replace them with rock gardens and cyprus bushes. There is a more aesthetic and productive way to avoid mowing and save water. Read on for tips on how! Do not fight the weeds. Work with them, then eat them! According to Penny Livingston of the Permaculture Institute of Northern California, "The most important permaculture tool is a hammock. First relax, observe, and think." The time you spend in your garden should be considering how to make natural systems work for you. Not performing back-breaking labor to fight against those systems. No need to reinvent the wheel here. The plants, insects and animals in your back yard have had centuries of practice at becoming prolific. How to observe and manipulate their natural tendencies has been well documented by many scientists and gardeners. Plant communities are a key concept in permaculture. Ordinarily in our fruit and vegetable gardens, we strive to produce a single crop in one place. Then we are constantly pulling weeds to assure that crop is the only plant in the area. Instead, try making sure the "weeds" around your crop are plants you want to use. Then combine plants that work together and compliment each other. For instance, take a look at your rose bushes from your hammock. What if all that grass you keep yanking from underneath were a crop of chives? Not only would you have something to sprinkle over your next baked potato, the insects that want to eat the aphids will have a place to live, and they will trade nutrients in the soil that prevent black spot and mildew. There are many other examples of plant communities to consider. Try searching for "companion plants" on the internet or look into some of the suggested reading at the end of this article. What will the neighbors think if I don't maintain a well manicured lawn? Sometimes following the dictates of your climate can look more traditional than a traditional yard. Herb Spiral: A gardenting shape that takes advantage of both horizontal and vertical space to make a large number of herbs accessible from one spot. The different slopes create different microclimates suitable for different types of plants. Irrigation can be a fountain like sprinkler at the top, allowing water to spiral downward. Image taken from GardeningTipsNIdeas. Swale: A trench dug into a slope with a berm on the downhill side. The purpose is to collect rain and create an underground plume of water that plants can tap into throughout the year. This image from LivingInDryden is freshly dug and on a large scale. Eventually plants could grow over it. 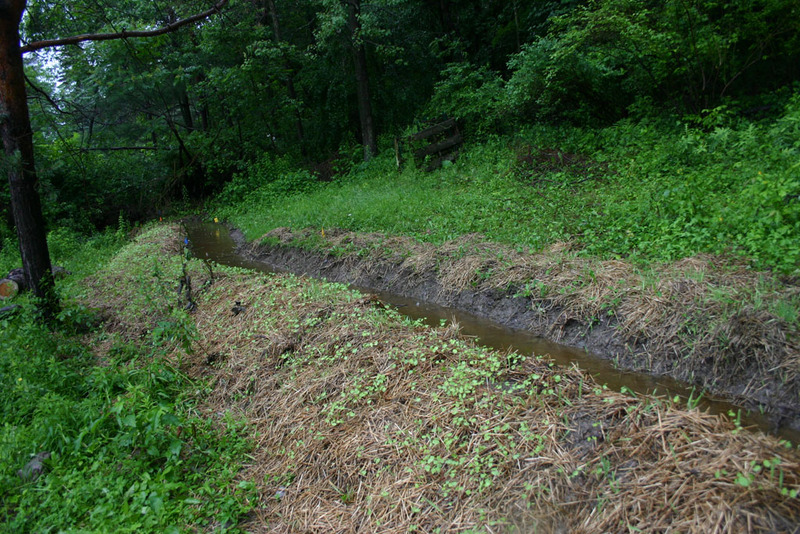 Smaller swales can be dug in smaller locations. Annuals Vs. Perennials: I understand if you cannot live without your fresh tomatoes, but for other annuals, look for perennial substitutes. This way you are not replanting and maintaining so much. Your garden perpetuates itself. For instance, instead of planting onions each year, try leeks. When a recipe calls for onions, and you have none handy, grab a leek from your yard instead. Plant Guilds: Groupings of plants that naturally occur together and seem to be connected as a whole. The image here from DryLandSolutions is of a very well known plant guild called "The Three Sisters". Cornstalks provide a trellis for beans. The beans fix nitrogen in the soil. Squash foliage inhibits any weeds. Plant guilds can become as complex as you like and go beyond just vegetables. When Life gives you lemons... Plant a lemon tree with supportive plants all around! "I have heard landscape designers lament the jobs given them by Realtors" Fred Bové informed me on a recent visit to the San Francisco Botanical Gardens. Fred is the director of adult education there, and very involved in the 12 week permaculture design certification course there. "When you list a home for sale, you hire landscapers to quickly and cheaply stage a yard with splashes of color that will only last for the few months that the home is listed." I can see his point. After the decision to sell a home is made, we have a time schedule to follow. Sure, it is possible to hire a permaculture landscape designer to help you leave a place better than you found it. You can find their contact information at the end of this article. Paying for permaculture should be more like paying for an education. The more it is used, the more valuable it is. Think of your yard when you are not thinking of moving. I know it is difficult with the need for two full time incomes to run a family to consider anything but your immediate needs. Try not to think of your yard as something that needs to be conquered. “A permaculture garden is not something that can be completed by this Saturday” says Fred Bové. “I think the proliferation of things like yoga classes prove that society is turning from warrior mode to lover mode.” Think in time with nature while spending time in your garden. Do not tackle the whole yard. Just change that one little thing you noticed while in your hammock. During this difficult housing market those who do not have to sell their home are waiting for a time it is more profitable to sell. Think what a selling point it would be at that time to have your yard carefully planned and providing colorful food instead of temporary color. What could be more appealing to a home buyer than a bountiful garden that can maintain itself? Permaculture with a local ecology restoring twist. This is the most referred to book for permaculture in suburbia, and my own personal favorite on the subject. Written by the founder of permaculture, with broad enough concepts to be implemented in any climate. Bay area projects and activism with a calendar of events. Based out of the UK, but the oldest permaculture periodical, and well respected. I know that herb spiral! Yep! We gots a brick one in our backyard.